Nearly 1 in 8 women will develop breast cancer. Receiving a diagnosis of breast cancer is difficult and life-changing for all women. Breast cancer care, breast cancer treatments, and the effect on women’s lives are often worse for women of lower socioeconomic status (SES). We aim to understand how best to help women of low SES make high-quality decisions about early stage breast cancer treatments. We will be comparing two decision aids used in the clinic visit to usual care (what normally happens in the clinic). We hope that the decision aids will help all women feel better about the decisions they make. We also hope to show that the interventions can reduce disparities in decision-making and treatment choice between women of high and low SES. 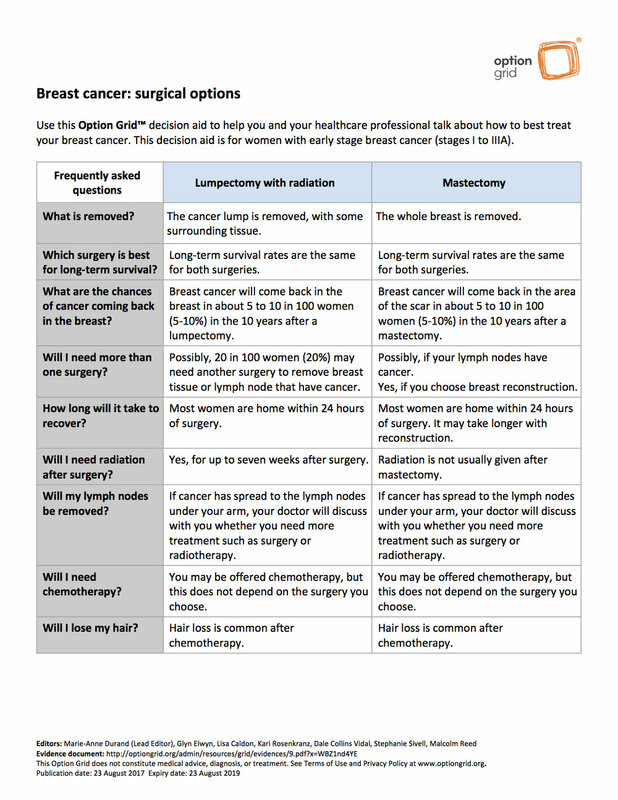 Developed in 2010, the Option Grid for Breast Cancer Surgery is a one-page, evidence-based comparison table that allows patients and clinicians to compare treatment options against patients’ frequently asked questions (1,100 downloads in 2015). It has been shown to increase patients’ knowledge and shared decision-making. 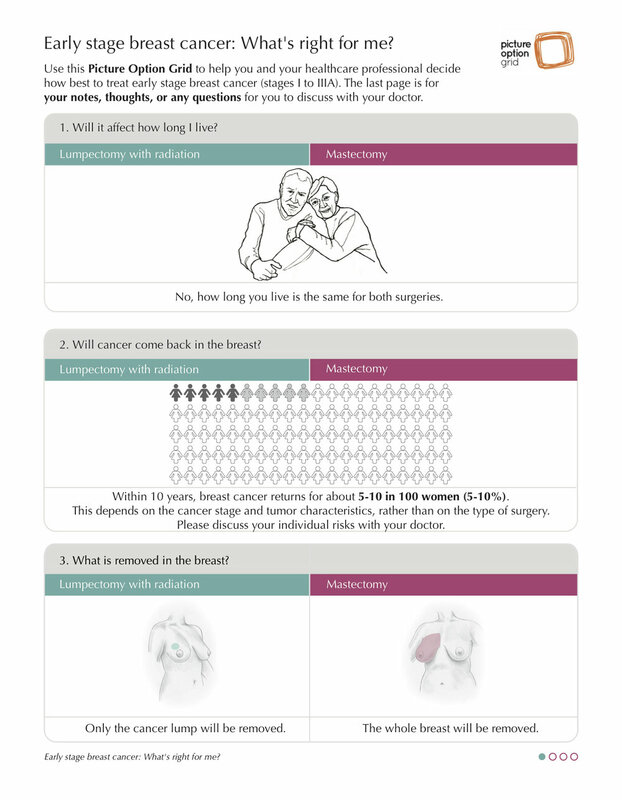 Learn more about the Option Grid for Breast Cancer Surgery and download it here. The Picture Option Grid is derived from the Option Grid, uses the same evidence as well as simplified text and images. It has been developed and iteratively tested with women of low SES. Because decision aids are not routinely available in real world settings, usual care is a coherent and legitimate comparator. It will include the provision of usual information resources about breast cancer but will exclude the provision of other decision aids. The involvement of patient and stakeholder partners has been critical in designing and planning the study. Four patients and three clinician stakeholder partners have been involved in developing the research questions, choosing outcome measures that are important to patients, designing the study and writing the research plan. Patients have also been involved in choosing, developing and testing the interventions. They will conduct the study, manage risks, and monitor progress. A patient associate (former breast cancer patient) will collect and analyze data at each site. A Community Advisory Board that includes patient and stakeholder representation from each study site will also be convened. The Entire dissemination plan, built around patient and stakeholder engagement, includes dissemination symposia organized by patient and stakeholder partners at each site. This study has been funded by the Patient-Centered Outcomes Research Institute (PCORI), you can read more about the What Matters Most study on PCORI's website, here. To read more about the What Matters Most study, you can read our Public Abstract or Scientific Abstract (each file opens in a new window).